Pure Telecom grew its customer base by 25% in 2016 and has set itself a target of 100,000 customers by 2019. 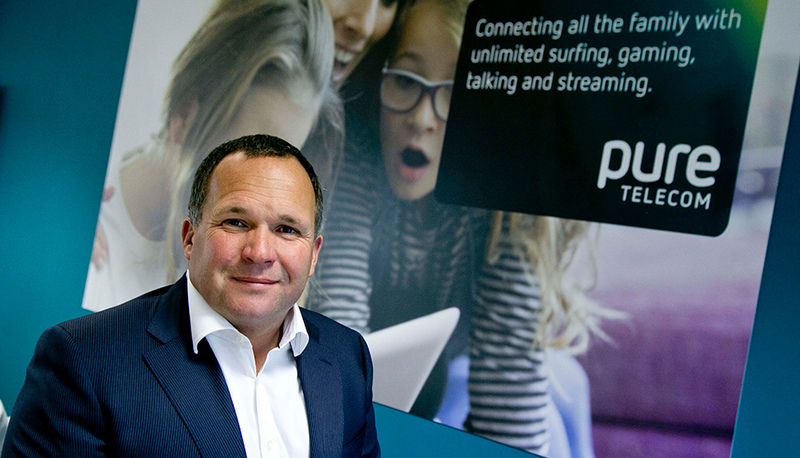 We caught up with the company’s CEO, Paul Connell, to find out what customers can expect from the up-and-coming broadband provider over the coming years. "What can customers expect from Pure Telecom over the next year?" Paul Connell makes no bones about it, Pure Telecom will be “aggressive” when it comes to attracting new customers and has set his sights on hitting a six-figure customer number over the next two years. And how do Paul and his team intend on achieving this? By offering “increased broadband speed and increased availability” to customers. As Paul says, “more and more people have availability of broadband and we’ll be selling to them, in rural Ireland, in the cities...wherever we can!”. "What role will Pure Telecom have in helping to bridge the urban-rural digital divide?" Paul Connell is open and proud about his company’s proactive work in helping to bridge Ireland’s urban-rural digital divide. Pure Telecom has been lobbying its network suppliers, eir and SIRO, to increase their fibre network and has been putting pressure on the Government with regards to the National Broadband Plan. Paul wants to see increased availability and a bigger broadband market on the island of Ireland. And he’s confident that Pure Telecom will be well able to compete with the better-known broadband behemoths out there. As he says, “we’ve always had a plan to be aggressive outside the main urban centres and we’re happy to sell, if customers are happy to buy”. "What are the biggest changes you have seen in consumer expectations and behaviour over the last 15 years?" Since Pure Telecom’s foundation in 2002, much has changed in terms of customer expectations and behaviors. As Paul puts it, “there’s been a total digital revolution”. Few would disagree. To highlight just how much things have changed, Paul recalls a story from a past Christmas Eve, when we was sitting with his five children, some of whom had just got their hands on the latest and greatest technology from that year; the iPod Touch. Initially confused as to how his daughters were making phone calls from a device that didn’t have a SIM card, Paul’s kids kindly educated him on the power of WiFi calling. It was another moment of clarity in Paul’s mind as to the way things were going. “Many people can’t function without a handheld device these days”, he says. As the number of connected devices in the typical Irish home continues to increase, Paul acknowledges that it’s broadband speed and reliability that matter most now, not the number of minutes on a landline plan. While Pure Telecom is determined to always remain competitive on price, speed and availability, it is the company’s customer service that Paul sees as its key competitive advantage. “I can’t always guarantee that we’ll be the cheapest, but I can guarantee that our customer service will be world class. When something goes wrong, we’ll be there to help”, says Paul. Pure Telecom’s Unlimited Fibre Bundle comes with unlimited 100 Mb broadband and unlimited calls to landlines. The deal requires an 18-month contract and costs €29 a month for three months, rising to €45 a month after that. If you don’t have a need for a landline, the provider’s Purely Broadband deal comes with unlimited 100 Mb broadband and costs €44 a month over an 18-month contract. To find the best broadband deal available in your area, visit our Compare Broadband, TV and Phone page on bonkers.ie.